And remember, these are the official figures. With the poor placement of stations (91 % of the stations are CRN3 to 5 = bad to very poor); where they have purposely taken away the urban heat island effect;, tweak, processes and “adjusted the data; GISS for example uses 1200 km smoothing (which assumes that the weather in Paris somehow directly affects the weather in Budapest) etc. 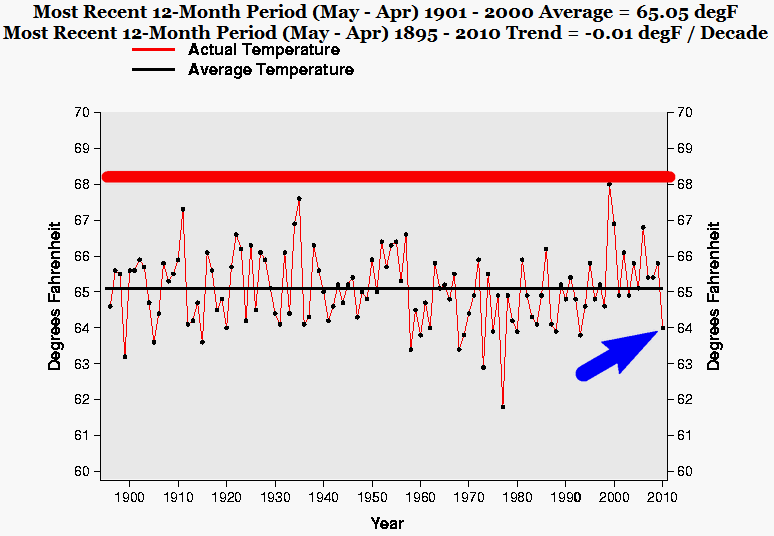 “The average temperature in April 2010 was 54.3 F. This was 2.3 F warmer than the 1901-2000 (20th century) average, the 14th warmest April in 116 years. 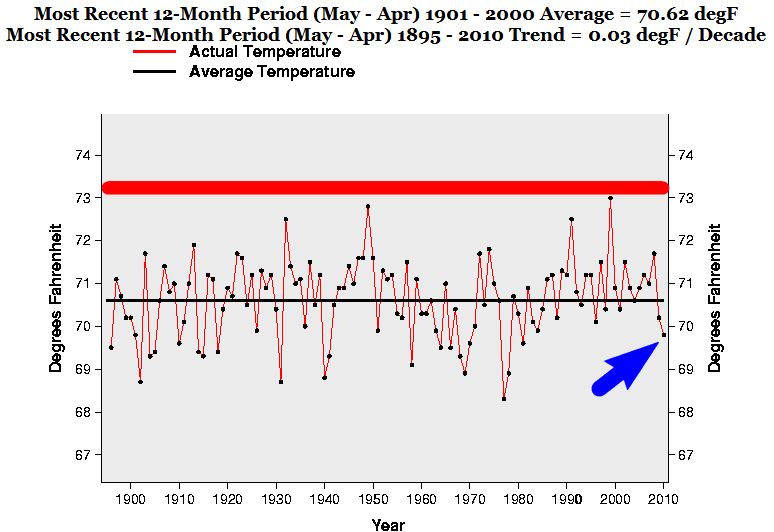 The temperature trend for the period of record (1895 to present) is 0.1 degrees Fahrenheit per decade. This year, the April temperature is -1.99 F cooler than 2006, the warmest April. And if we compare this year’s April with 1981, the second warmest April, it is -1.88 F cooler. If we compare with 1924 this year’s April is -1.29 F cooler. 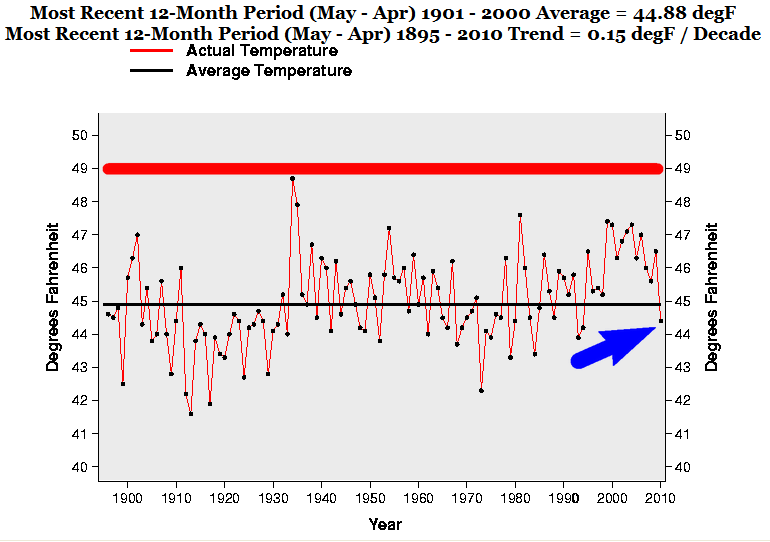 This year, the April temperature is EXACTLY THE SAME AS IN 1895! AND 1910. In fact it is 0.25 F COOLER. One fifth of a degree cooler in 100 years. And the recent 3 Month period (Feb-Apr) 1895-2010. This year, the Feb-Apr temperature is -2.93 F cooler than for example 1925. And if we compare this years Feb-Apr temperature with 1946 it is -2.66 F cooler. 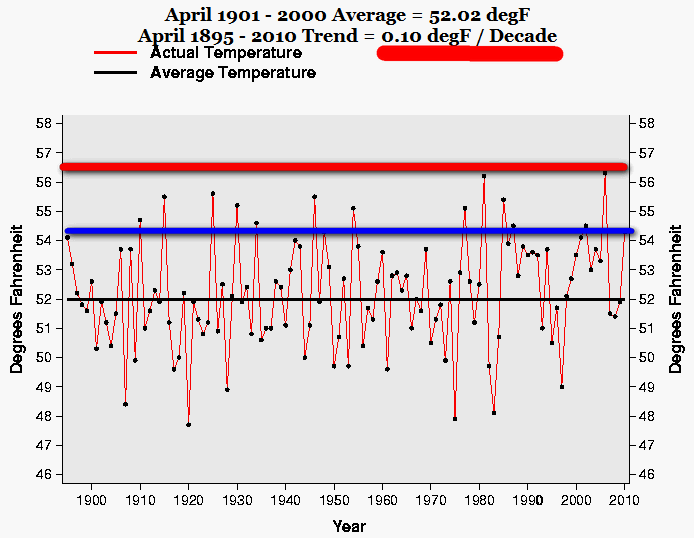 This year, 2010 (Feb-Apr), the temperature is EXACTLY THE SAME AS IN 1907! In fact it is 0.05 F COOLER. One twentieth of a degree cooler in 103 years. This year, the recent 12 Month period temperature is -1.66 F cooler than for example 1934. And if we compare with 1954 it is –1.31 F cooler. 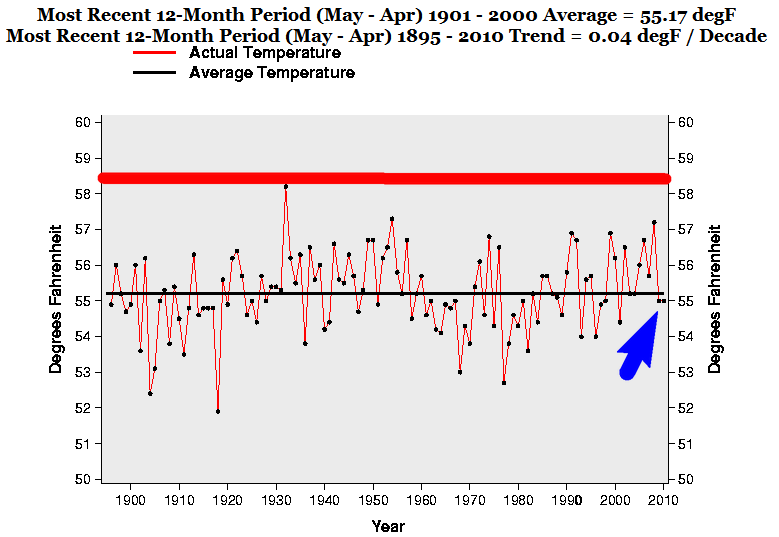 This year, 2009 /2010 (May-Apr), the temperature is EXACTLY THE SAME AS IN 1898! AND 1900. AND 1902. In fact it is 0.01 F COOLER. One hundreth of a degree cooler in 110 years. 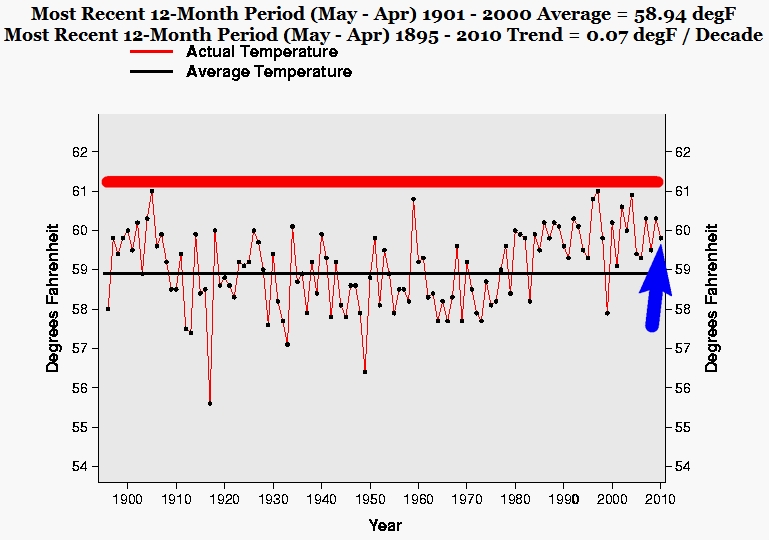 This year, the recent 12 Month period temperature is -1.2 F cooler than for example 1905. And if we compare with 1959 it is –1 F cooler. This year, the recent 12 Month period temperature is -2.6 F cooler than for example 1902. And if we compare with 1934 it is –4.3 F cooler. 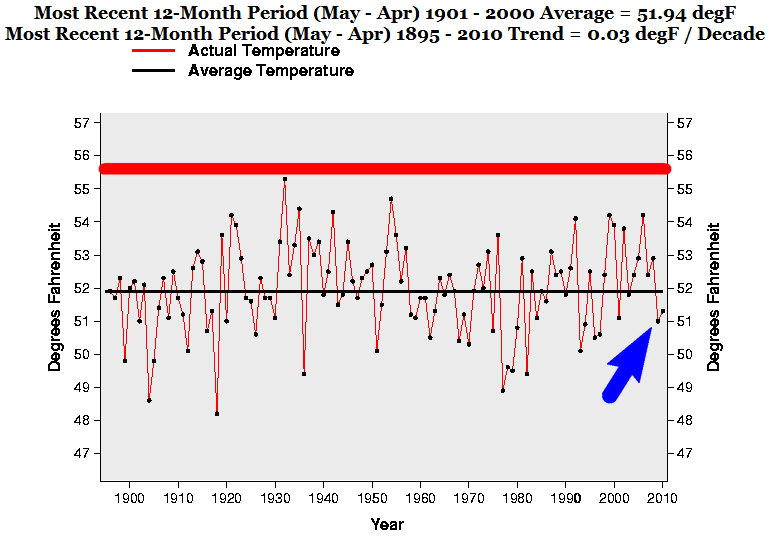 This year, the recent 12 Month period temperature is -2.1 F cooler than for example 1913. And if we compare with 1949 it is –3 F cooler. 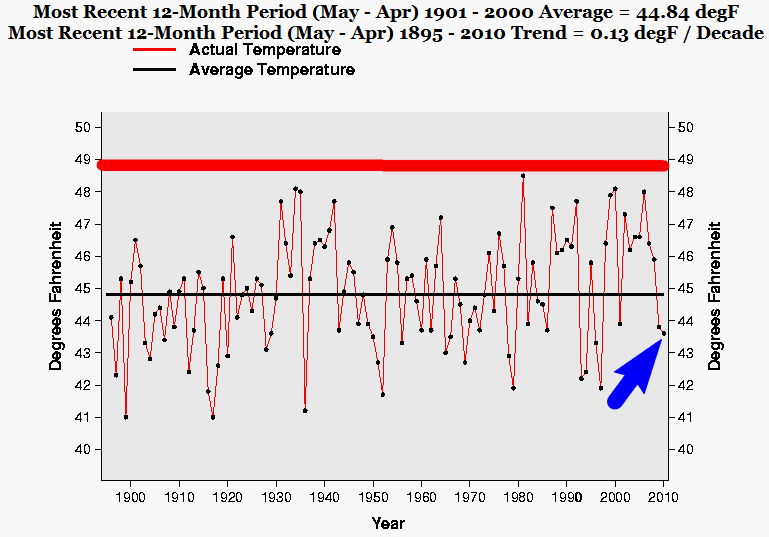 This year, the recent 12 Month period temperature is -4 F cooler than for example 1932. And if we compare with 1954 it is –3.4 F cooler. 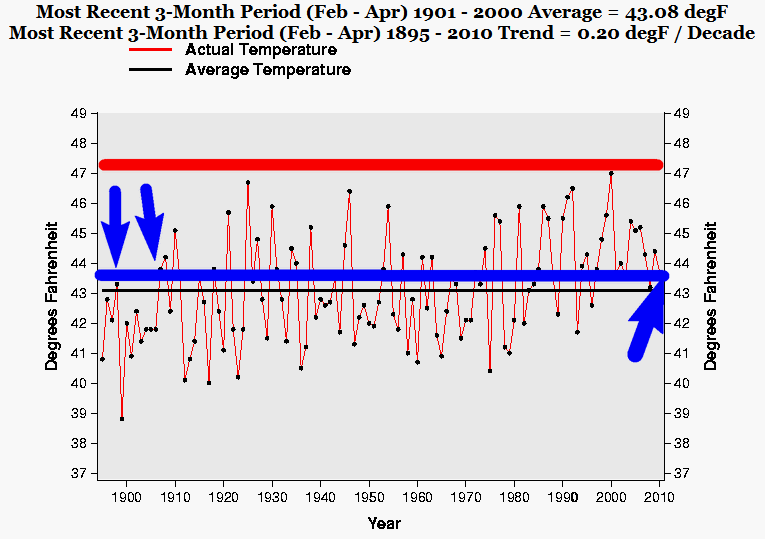 This year, the recent 12 Month period temperature is -3.2 F cooler than for example 1932. And if we compare with 1921 it is –1.8 F cooler. 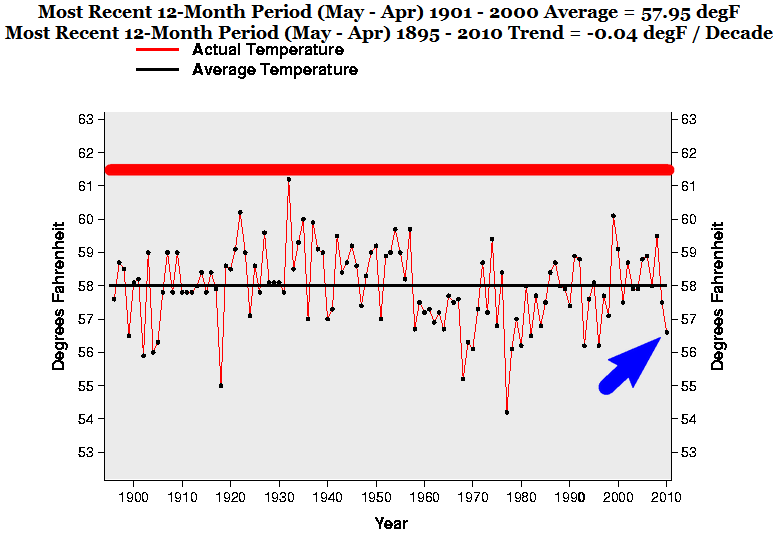 This year, the recent 12 Month period temperature is –12,6 F cooler than for example 1931. And if we compare with 1990 it is –13,8 F cooler. This year, the recent 12 Month period temperature is -4.6 F cooler than for example 1932. And if we compare with 1922 it is –3.6 F cooler. 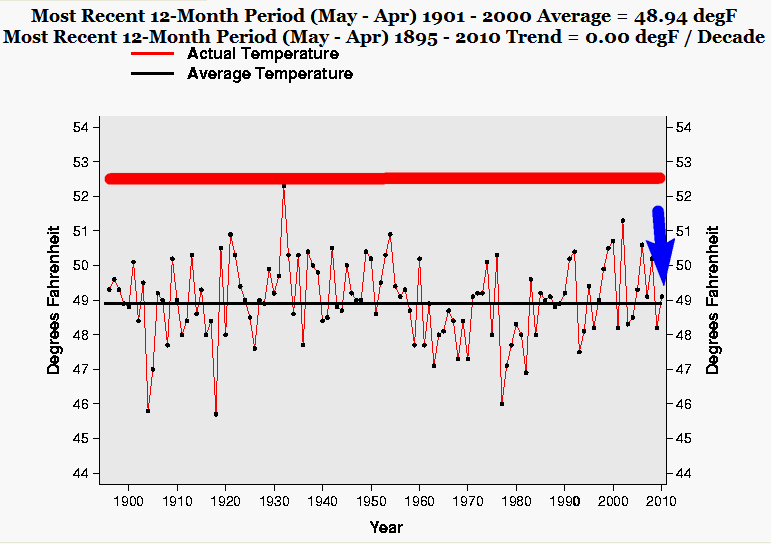 This year, the recent 12 Month period temperature is -3.3 F cooler than for example 1911. And if we compare with 1935 it is –3.6 F cooler. 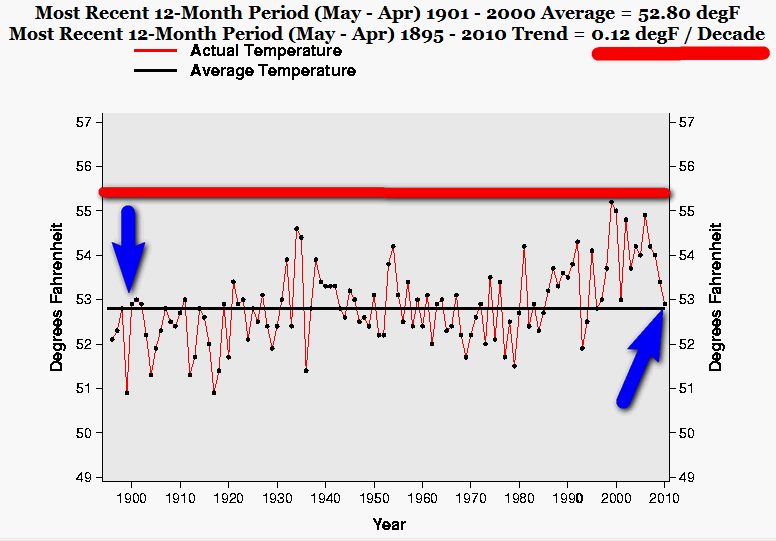 This year, the recent 12 Month period temperature is -3.2 F cooler than for example 1932. And if we compare with 1954 it is –2.4 F cooler. This entry was posted on 21 maj, 2010 at 2:20 e m and is filed under Fri- och rättigheter, Miljö - Environment, USA, Yttrandefrihet. You can follow any responses to this entry through the RSS 2.0 feed. You can leave a response, or trackback from your own site.